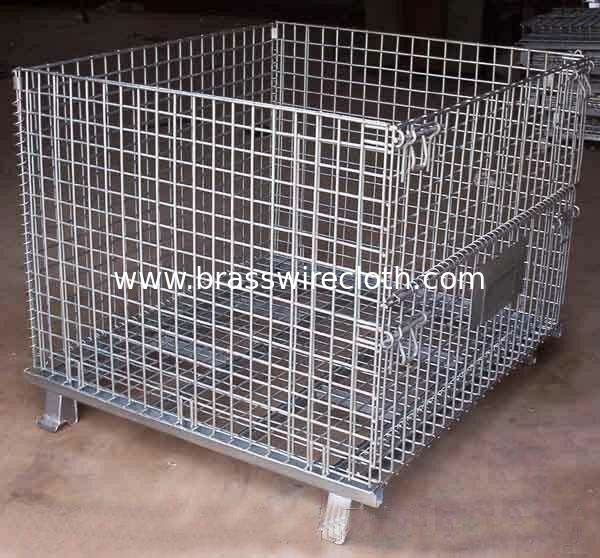 Folding metal Wire Container, also named as folding wire cage, mesh pallet cage, butterfly cage, are a type of popular industrial containers, they have the functions of pallet and cage, they are widely used for bulk materials handling, transportation and storage, especially for automotive parts, accessories and spare parts, hardware,machinery, electronics etc. 1. Hard working, returnable wire containers deliver high visibility savings. 2. Handle, transport and store bulk parts and material the efficient way. 3. Perfect container for in-line assembly work or work-in-process operations. 4. Fully collapsible and stackable 4 high. Packed in Bubble film wrapping and bubble bag or it can depend on your requirements. Unified operation accompanied by transmission equipments,from goods storage to final delivery.It presents unbelievable benefits by reducing a lot of wastage and labor cost. Saving more space.Space saving will be up to 80% by folded when it's empty. Open wire mesh design allows for full visibility for inventory checks,ventilation and cleaness. Special feet structure ensures the stabilization when loaded down.